The train pulled into Florence’s Santa Maria Novella station and I prepared myself for heart palpitations, fainting, dizziness, or to spontaneously burst into tears. Why, you may ask? These are some of the psychosomatic responses that a “victim” may have when they are exposed to great amounts of art in a single place. With artistic splendor around every corner, Firenze (Italian name for Florence) is a prime breeding ground to trigger Stendhal syndrome (often called Florence syndrome). Luckily, I didn’t faint dead away. But when my husband and I renewed our wedding vows in the Bardini Gardens overlooking the breathtaking city? My heart did beat a little faster. Taking a high-speed train through Tuscany was a perfect way to enter Florence. We passed ancient Roman ruins, saw medieval walls high atop hill towns, and gazed out at vineyards and olive groves. The Tuscan countryside had a decidedly different feel from the hustle and bustle of Rome. 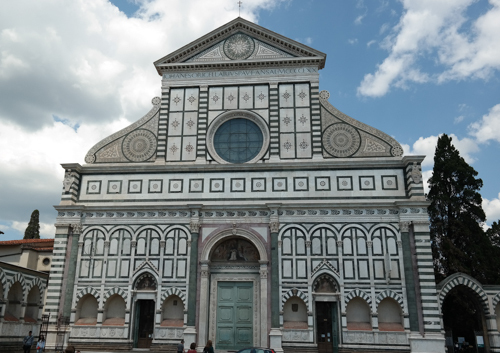 When we arrived at Santa Maria Novella train station, we found ourselves in front of the church of the same name. The green and white marble façade is emblematic of Florentine Renaissance architecture. Featuring works by Brunelleschi, Masaccio, Giotto, and other artists, the interior boasts much to see. We didn’t have time at that moment, but I made it a point to go back later and see the Italian Renaissance frescoes that Florentine churches are known for. The Italian Renaissance was a time of optimism with hope that a new age marked by artistic expression, intellectualism, and innovation would emerge. For a Florentine family called the Medici, it was a very prosperous time. Banking made them a fortune and they came to dominate the city. With great appreciation for culture and the arts, Cosimo de’ Medici (the Elder) paid creative geniuses like Fra Angelico and Donatello to create gorgeous art. Medici’ patronage of the arts flourished on an even grander scale with Cosimo’s grandson, Lorenzo (the Magnificent), who hired Michelangelo, da Vinci, Botticelli, and other masters. He and his colleagues supported philosophers who emphasized humanism—putting critical and rational thinking over religious dogma and superstition. Humanists valued classical learning and study of the humanities. This classical revival is evident in the art and architecture of the time. Since the Italian Renaissance started in Florence, I wanted to really immerse myself in the era so I chose to stay in the historic center. After leaving Santa Maria Novella we meandered down medieval streets. I was enamored with the architectural details of the buildings: arched doors, elaborate doorknockers, and the fleur-de-lis symbol (my absolute favorite) on just about everything. We turned onto a narrower lane and I felt as if history burst alive. The street whispered to me, “Michelangelo walked here, da Vinci walked here.” I veered off down an alley for a minute and was by myself—there were no tourists. Since the historic center of Firenze is virtually cleared of traffic, I was able to transport myself back in time. I could hear a horse clopping nearby (turns out there actually was one). I looked up at a dirty, stone wall with a small, grimy window covered with a wrought-iron grill and imagined that this building had likely stood there since the Black Plague. I touched it anyway. 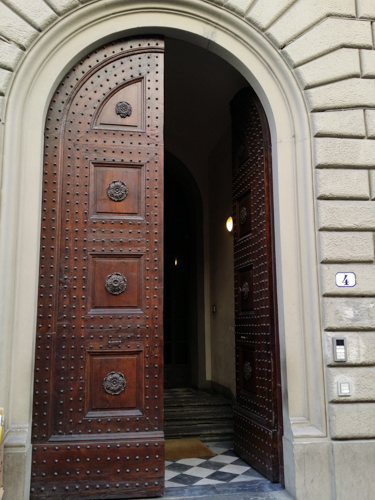 When I emerged from my reverie, we found the street we were looking for, S. S. Borgo Apostoli, and came upon a massive wooden door with a charming lion doorknocker. Here was our home for the next few days—the Hotel Alessandra. Andrea greeted us at the front desk; he was friendly and warm and I knew that I had picked well. The hotel is housed in a historic building dating from 1507. Our room was spacious with soaring ceilings and a beautiful view of a historic bell tower and the Arno River (picture at end of article). Andrea encouraged us to have a welcome drink on the terrace, which had a great view of the tower, too. We also enjoyed the hotel’s breakfast, especially the cappuccino with the smiley face, which was the perfect send off before a day of sight-seeing. A wonderful thing about Florence is that everything is quite close together, so as long as you stay in the city center you shouldn’t have more than 20 minutes of a walk to get anywhere. I loved Hotel Alessandra’s location because I could easily cross the river and get to sites in the Oltrarno (more on this in another article) while still being just a few minutes from the Duomo. Our hotel was just around the corner from the Palazzo Vecchio, which has been the seat of city government (a portion of it currently houses the offices of the mayor). The “Old Palace” has many outstanding rooms to roam through, but we explored beneath the structure first. There is an archaeological tour of a 1st century BC Roman theater that is quite interesting providing an ancient perspective of the area. The crowning glory of the palace though is the Hall of Five Hundred—the sumptuous reception hall where Florence’s legislative assembly gathered. This lavish room has monumental paintings by Giorgio Vasari. Visitors can continue on through the areas that were used by Cosimo I de’ Medici and his wife, Eleanora of Toledo as a home—where you can see outstanding frescoes in her apartments and chapel. I liked the big globes in the maps room, too. 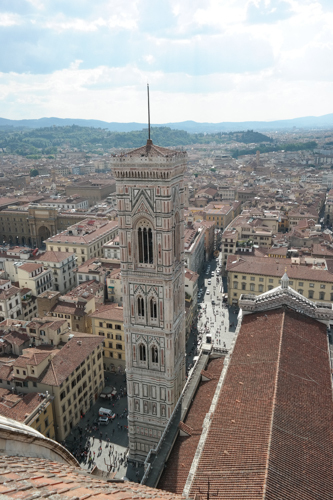 Weather permitting, you can climb the tower for a different view of Firenze. In front of Palazzo Vecchio is Piazza della Signoria and the Loggia dei Lanzi. You can see where Michelangelo’s statue of David once stood (a copy is now in its place), where Girolamo Savonarola and his followers burned books and other works in the Bonfire of the Vanities, and where he was later hanged and burned (a plaque marks the spot). 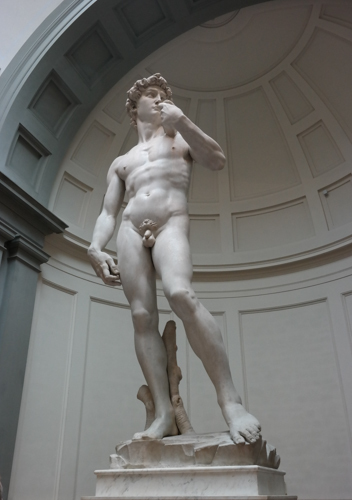 There are many statues in the piazza and under the loggia, but the original David is on display at the Accademia. David is a work of art not to be missed. If you can only go to one museum and see one piece of art while in Florence, make it David. Carved from one piece of marble, this 14-foot statue is perfection. David is confident and ready to go to battle, but he’s not arrogant. Instead, he’s contemplative, as if he’s assessing the situation. Michelangelo turned rock into reality. You should see it for yourself, but make a reservation or get the Firenze Card because otherwise you could be waiting in line for a very long time. The Firenze Card is 72€ for 72 hours and covers 72 museums. It’s quite pricey, but for us it was worth it because we saw a lot and could skip museum lines. If you do not buy the Firenze Card, you should really make a reservation at both the Accademia and the Uffizi or risk standing in line for hours and/or not even getting in. Since the Cosimo de’ Medici was quite wealthy and I love palaces, I was excited to see the Palazzo Medici-Riccardi. You can imagine my surprise when I came upon the rather plain, sandstone building. Its homely exterior belied its striking interior though. Cosimo purchased this house as the first in the Medici Quarter (make sure to go nearby and see the Medici Chapels, too, especially the one designed by Michelangelo). Lorenzo further embellished the rooms with art, antiques, and furnishings. Generations later, Medici relatives would occupy this palace, the Palazzo Vecchio, and the Pitti Palace. Today, visitors can appreciate the Medici coat of arms in the courtyard, wander through the gardens, admire wise men in the Chapel of the Magi frescoes, and stare at the heavenly ceiling in the huge Luca Giordano hall. As I left, I thought about how close the palace was to the Duomo. When Cosimo provided funds to finish the dome he gave himself a pretty spectacular view! When thinking of Firenze, it’s a huge dome the color of burnt sienna that first comes to mind. Florence’s main cathedral, Santa Maria del Fiore, was started in 1296 under Arnolfo di Cambio but it wasn’t until Brunelleschi added his immense cupola in 1436 that it was finally finished. If you’re in the mood for a stair-stepping workout, climb the 463 steps to the top of the Duomo. It is very tight though and the twisted corridor can get clogged with one group (either those going up or down) having to wait for the other to pass before moving themselves. This can lead to hot, stuffy moments standing still. I saw people getting claustrophobic and having to climb back down. The view from the top was worth the discomfort—it was quite dramatic to see all of Florence and some of the Tuscan countryside spread out below. To the side of the church is Giotto’s Bell Tower (Campanile). Finished in 1359, it has a stately look—a tall, square tower with colorful rose, green, and white marble. You can climb it, too. Behind the church is the Duomo Museum which highlights the golden age of Florence art, in particular sculpture—statues of popes, saints, and sinners abound. They have a wonderful pieta by Michelangelo, works of Donatello, reliquaries and relics, and Ghiberti’s original doors. Make sure to visit the terrace for a panoramic view of the Duomo—one of the best around. 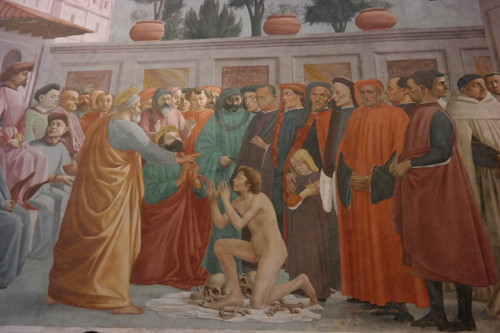 If you would like to see more art by Italian Renaissance masters, the renowned Bargello Museum is not far. Housed in one of the oldest public buildings in Firenze, pieces by Renaissance greats like Donatello, Luca della Robbia, and Michelangelo occupy the same space that prisoners once did. Also, near the famous cupola are the statues on the façade of Orsanmichele church. Although a lot of Italian Renaissance artists painted on canvas, many of them also decorated churches and the Basilica of Santa Croce (Holy Cross) is a prime example. Their inexpensive map (I recommend purchasing one on your way in) states: “Santa Croce has always been a prominent symbol of Florence and a meeting point of the greatest artists, theologians, writers, humanists, and politicians…”. There is a lot to see in this massive basilica with art by Cimabue, Giotto, Brunelleschi, Donatello, Ghiberti, Vasari, and Bronzino and the building’s architecture is Florentine art at its finest. The church is also the final resting place for Michelangelo, Ghiberti, Machiavelli, and Galileo. In front is a large and lively piazza and around the side is a leather school. For more Renaissance pleasure, head over the Arno River to Santa Maria del Carmine. When you arrive at the church, the first thing that you might notice is that it’s not the prettiest one around. But don’t let that deter you, because treasures abound within. In the Brancacci Chapel, frescoes by Massaccio, Masolino, and Lippi tell stories of St. Peter. Mostly painted in the 1420s, the murals show his life and crucifixion. They are as vivid as can be; it’s difficult to believe these masterpieces weren’t painted yesterday. In the nearby cloister is a lovely painting of the Last Supper by Alessandro Allori (1582). Although these sites are sure to bring the history of the Italian Renaissance alive for you, there are many more places in Florence to immerse yourself in the beauty of the Renaissance Age, as well as that of other times. We’ll experience some of those places in my next article on Firenze. Until then, ciao! Psst…Roaming Historian readers can save money on Roman Guy tours! And they have tours of Florence! Just use the Roman Guy promo code “ROAMING” when booking to get 5% off of most small-group tours. Buon viaggio! If you enjoy our pictures, please check out our photography shop on Etsy where you can purchase our prints. We don’t have all of our photographs listed on our Etsy site though, so don’t hesitate to contact us if you see a picture in a blog post that you would like to order. Previous Previous post: Art Treasures of Rome—Michelangelo, Bernini, and Raphael, Oh My!